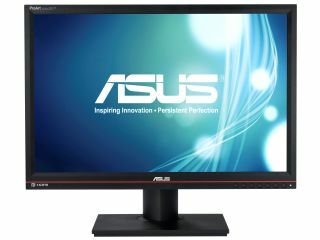 Asus has announced its latest 24-inch LCD monitor – with the PA246Q ProArt series bringing a native resolution of 1920 x 1200. The 16:10 monitor features a P-IPS panel that apparently offers up to 98 per cent reproduction of Adobe RGB colour space – which explains the ProArt moniker. "The Asus PA246Q also comes with the Asus-exclusive QuickFit Virtual Scale and a highly adjustable stand to enhance users' productivity. DisplayPort, HDMI, DVI-D and D-Sub inputs are included for easy connection to multiple devices," adds Asus. Other features include a sRGB mode and the capacity to display an impressive 1.07 billion colours. This is a professional grade monitor – built for designers or people who really, really care if their colours are accurate. We haven't been given a UK release date or price as yet, but we are checking right at this moment.